Many Masonic Bodies across the United States have come into possession of various treasures over the years. These can range from simple minute books from bygone eras that bear the signatures of important men of the times to more awe inspiring items. For example, Norman Masonic Lodge No. 38 AF&AM proudly displays a tyler’s register from 1899 bearing the signature of James S. Buchanan who was the fourth President of the University of Oklahoma. [i] It is in the antechamber of Lawton Commandery No. 18 in Lawton, Oklahoma that a truly great Templar treasure can be found. It was in the late 1940s that an artillery officer stationed at Fort Sill, Major Ralph L. Paddock Jr., presented a special gift to the Sir Knights of Lawton. 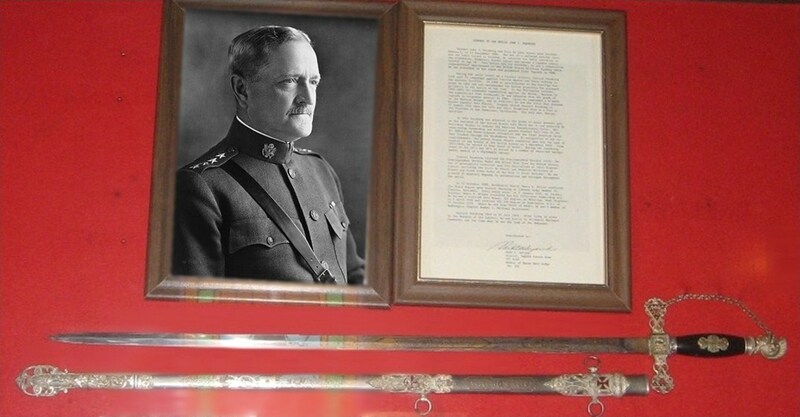 [vii] As one enters the asylum they will notice a large shadow box hanging in the antechamber that contains what appears to be a rather non-descript sword of Nebraska regulation, some letters, a photo, and two brass plaques. 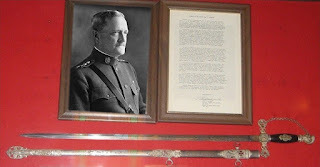 Upon closer inspection the curious will find that this particular sword bears the name of one of this Nation’s great military heroes, General John J. Pershing. It is only fitting that such a memento would be deposited in a locale steeped in Military History. One never knows what may await them in the archives of the various Masonic Bodies across the land, some truly contain hidden treasures. Even if that stack of papers in the back room does not yield up that rare signature or those rusty old swords in the armory do not bear a notable name, the fellowship is always well worth the distance traveled and a treasure unto itself. [i] Norman Lodge No. 5 AF&AM, Tyler’s Register, 1898 – 1901, Private Collection, Norman Lodge No. 38, Norman, Oklahoma. [ii] "Fort Sill," Oklahoma Historical Society's Encyclopedia of Oklahoma History and Culture, <http://digital.library.okstate.edu/encyclopedia/entries/f/fo038.html>, Accessed 6 April 2011. [iii] The Oklahoma Consistory (January 1918), Vol. 3, No. 1. [iv] Fort Sill Masonic Club, Memorial Plaque, Post Chapel, Fort Sill, Oklahoma. [v] Ewell Lewis Head, Photos, 1897 – 1936, Private Collection, David Greenshields, Stillwater, Oklahoma. [vi] Robert G. Davis and James T. Tresner II, Indians, Cowboys, Cornerstones, and Charities: A Centennial Celebration of Freemasonry in Oklahoma (Guthrie: The Most Worshipful Grand Lodge of the State of Oklahoma Library and Museum, 2009), 156 – 161. [vii] Department of the Army, Official Army Register: January 1951 (Washington, D.C.: Government Printing Office, 1951), Vol. 1: 514. [viii] William R. Denslow, 10,000 Famous Freemasons (Richmond: Macoy Publishing & Masonic Supply Co., 1957), Vol. 3: 331. [ix] “John Joseph Pershing, General of the Armies,” Arlington National Cemetery Website, <http://www.arlingtoncemetery.net/johnjose.htm>, Accessed 6 April 2011. [xii] William W. Savage, Jr., Class Lecture Notes, US Military History to 1902, University of Oklahoma, Fall, 2005. [xiii] Larry Johnson, Historic Photos of Oklahoma (Nashville: Turner Publishing Co., 2009), 105.